Long a shadowy figure in the history of philosophy, it was only in the twentieth century that Giambattista Vico (1668-1744) achieved renown as a major and original thinker. There has been a steadily widening interest in this figure who, had he been known in his own day, might have altered the course of European thought. Much has been written in an attempt to clarify his historical stature, but in Time and Idea A. Robert Caponigri approaches Vico's thought in terms of its relevance to problems of modern philosophy. Viewing the essential problem of twentieth-century philosophy as the elimination of human subjectivity from nature, Caponigri shows how Vico offers us a principle for the vindication of our own spirituality through history.In Caponigri's reading, Vico establishes an absolute dichotomy between nature and history. The latter is seen as the sum of the active, fully realized human spirit and thus the context for the true understanding of human nature. Although Vico's major work, The New Science, incorporates vast amounts of concrete historical research and contruction, Caponigri's focus is on Vico's theoretical apparatus. Following an introductory biographical chapter, the author turns to Vico's theory of history, emphasizing its importance as a genuine philosophical undertaking rather than mere methodology. Caponigri shows how the speculative problem of history first presented itself to Vico in matters of jurisprudence and natural law from which he derived the concepts of time and idea as the terms in which the historical process of culture becomes comprehensible. 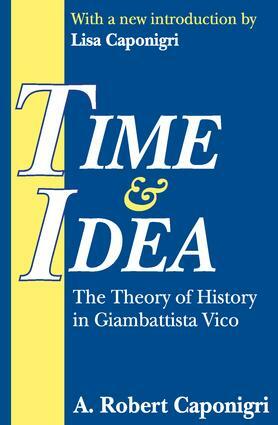 He then introduces the human subject as the principle of the synthesis of time and idea, and discusses the Vichian concept of the "modification of the human mind," and his idea of "providence" as the rectifying principle of human history.First published in 1953, Time and Idea remains an essential contribution to the ongoing dialog on Vico's work.